With news of Android 4.4.4 rolling out to the Verizon Moto G, more than a few readers lamented that Motorola wasn’t giving the Moto X preferential treatment. Lucky for those folks, the company has begun a consolatory soak test for those who are a part of the Motorola Feedback Network. 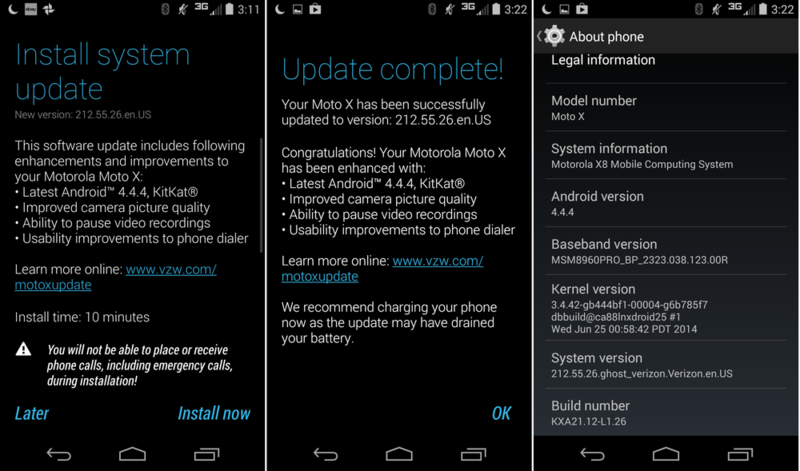 The changelog for the firmware in testing, KXA21.12-L1.26 is not dissimilar to the Verizon Moto G’s we saw yesterday. Improvements include enhanced camera picture quality, the ability to pause video recordings, and usability improvements to the phone dialer. Assuming that testing goes well, a source of ours states that a broad rollout will begin July 30. Don’t lose faith, Verizon Moto X owners!